I don’t have too many photos of myself working. That’s what happens when you’re most often behind the camera. But this one, taken by Uncharted photo assistant John Milligan, is definitely my favorite. 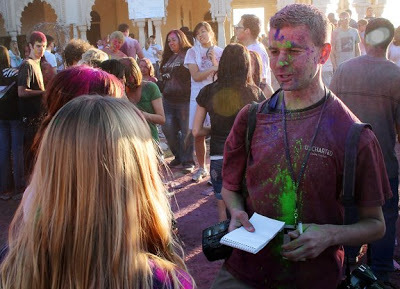 Covering the Holi Festival of Color last weekend at the Krishna Temple in Spanish Fork, Utah, was one of the more unusual assignments I’ve photographed and written about. Over 15,000 people packed the hillside just below the temple waiting to throw bags of powdered dust into the air and all over each other. Most of the battle for good photojournalism is simply placing yourself in the right place and waiting for the right moment. Whenever I cover a story, I’m always looking to position myself in such a way as to ensure that I’m ready when the climax of the event goes down. I positioned myself at what seemed to be the focal point, a pile of dry wood with a plastic witch-like figurine sitting on the top, ready to be burned. As it turns out, the figurine was an effigy of the demoness Holika, for whom the Holi Festival of Color derives its name. I figured everyone’s attention would be on the fire, at least for the first few seconds. After that, you just need to run with what happens. So when the bonfire was lit and people began throwing colored flour all over the place, you could barely see a thing. The plastic bags covering my cameras started falling off and for moments, here and there, it was hard to breathe. The fire was so hot that it started to burn even though I was almost 15 feet away. Before I knew it, I was sandwiched in the middle of thousands of people with barely any room to move, wishing I had a wider angle lens. But there was something exhilarating about being in the middle of it all, even covered head to toe in colored powder. At Uncharted ,we try to promote a philosophy of “Explore. Live. Feel.” That means when we cover a story, we immerse ourselves in it. We want to show you what it was like to be there. I hope I achieved that with this story. In any case, events like these make me excited to get out there and do more stories and photos for Uncharted.